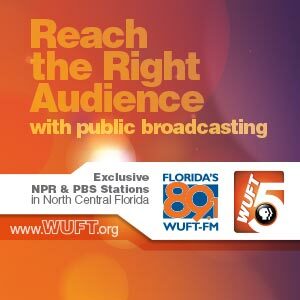 If you’re a business owner looking to help the community while also promoting your business, look no further than Florida’s 89.1 WUFT-FM, WJUF-FM and WUFT Classic. As an underwriter on on these public radio stations you contribute to a valuable service and reach an exceptional listener at the same time. You will signal your commitment to high-quality programming while also letting listeners know you are one of the organizations and businesses that make their favorite programs possible. The stations are the medium of choice for many of the education and health professionals that reside in the North Central Florida area, and studies show a majority of public radio listeners respond to and patronize businesses that underwrite public radio. WUFT Classic features a collection of classical music, jazz and live and recorded performance programming – 24 hours a day, seven days a week. Tune in via the online stream at wuft.org, on an HD radio at 89.1-2, or now there is a new way to listen – on 102.7 FM in Gainesville.